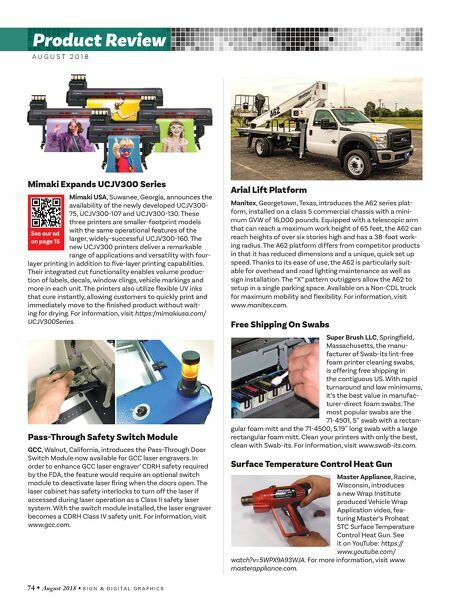 74 • August 2018 • S I G N & D I G I T A L G R A P H I C S A U G U S T 2 0 1 8 Product Review Mimaki Expands UCJV300 Series Mimaki USA, Suwanee, Georgia, announces the availability of the newly developed UCJV300- 75, UCJV300-107 and UCJV300-130. These three printers are smaller-footprint models with the same operational features of the larger, widely-successful UCJV300-160. The new UCJV300 printers deliver a remarkable range of applications and versatility with four- layer printing in addition to five-layer printing capabilities. Their integrated cut functionality enables volume produc- tion of labels, decals, window clings, vehicle markings and more in each unit. 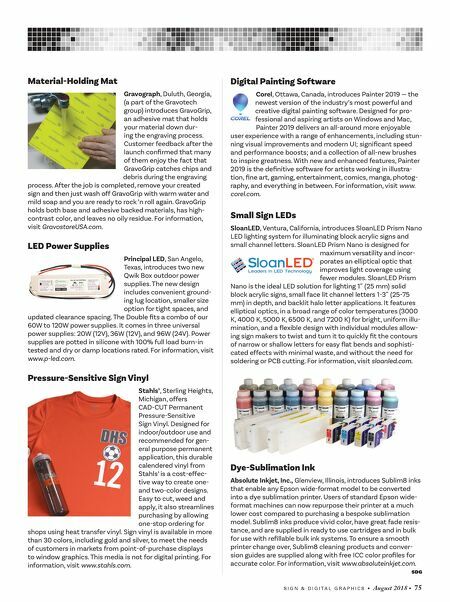 The printers also utilize flexible UV inks that cure instantly, allowing customers to quickly print and immediately move to the finished product without wait- ing for drying. For information, visit https:/mimakiusa.com/ UCJV300Series. See our ad on page 15 Arial Lift Platform Manitex, Georgetown, Texas, introduces the A62 series plat- form, installed on a class 5 commercial chassis with a mini- mum GVW of 16,000 pounds. Equipped with a telescopic arm that can reach a maximum work height of 65 feet, the A62 can reach heights of over six stories high and has a 38-foot work- ing radius. The A62 platform differs from competitor products in that it has reduced dimensions and a unique, quick set up speed. Thanks to its ease of use, the A62 is particularly suit- able for overhead and road lighting maintenance as well as sign installation. The "X" pattern outriggers allow the A62 to setup in a single parking space. Available on a Non-CDL truck for maximum mobility and flexibility. For information, visit www.manitex.com. Free Shipping On Swabs Super Brush LLC, Springfield, Massachusetts, the manu- facturer of Swab-its lint-free foam printer cleaning swabs, is offering free shipping in the contiguous US. With rapid turnaround and low minimums, it's the best value in manufac- turer-direct foam swabs. The most popular swabs are the 71-4501, 5˝ swab with a rectan- gular foam mitt and the 71-4500, 5.19˝ long swab with a large rectangular foam mitt. Clean your printers with only the best, clean with Swab-its. For information, visit www.swab-its.com. Surface Temperature Control Heat Gun Master Appliance, Racine, Wisconsin, introduces a new Wrap Institute produced Vehicle Wrap Application video, fea- turing Master's Proheat STC Surface Temperature Control Heat Gun. See it on YouTube: https:// www.youtube.com/ watch?v=5WPX9A93WJA. For more information, visit www. masterappliance.com. Pass-Through Safety Switch Module GCC, Walnut, California, introduces the Pass-Through Door Switch Module now available for GCC laser engravers. In order to enhance GCC laser engraver' CDRH safety required by the FDA, the feature would require an optional switch module to deactivate laser firing when the doors open. The laser cabinet has safety interlocks to turn off the laser if accessed during laser operation as a Class II safety laser system. With the switch module installed, the laser engraver becomes a CDRH Class IV safety unit. For information, visit www.gcc.com.